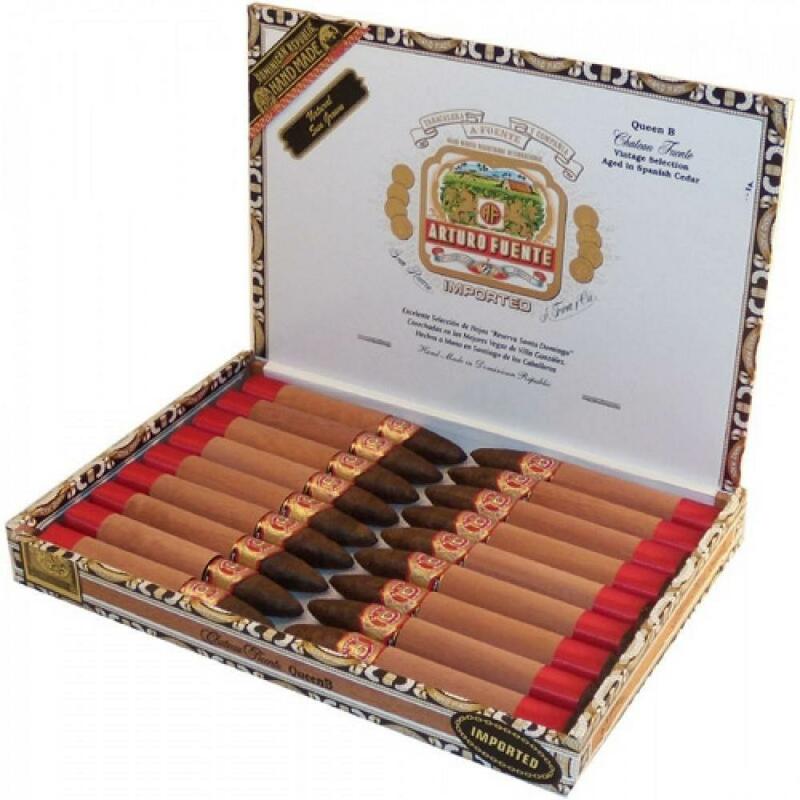 A dark Ecuadoran sun-grown wrapper leaf covers the renowned Gran Reserva's specially aged binder and filler tobaccos. The Arturo Fuente Sun Grown Queen B has become a standard for aficionados looking for the perfect medium-bodied Sun Grown Belicoso. Excellent! You could break the bank trying to impress your new client, boss or friend with an expensive cigar, but why would you want to do that? Arturo Fuente makes it a simple process by creating unique, high quality cigars at a reasonable price. Whether you purchase them in your favorite cigar shop or online, Fuente is an obvious choice sure to impress the most demanding cigar smokers. The Arturo Fuente Chateau Fuente Queen B is a small batch cigar containing aged Dominican long fillers and a dark Sun Grown Ecuadoran wrapper creating a distinct experience. The medium-bodied, Chateau Fuente Queen B Sun Grown offers a smooth, naturally sweet aroma and wonderful flavors. Notes of coffee, leather and spice permeate all the stages of this memorable smoke. Sun grown tobaccos are dark and oily due to the direct rays of the sun during the growing process. The oil in the tobacco keeps the leaf flexible which is vital to rolling an excellent cigar. Sun grown wrappers are usually sweeter than shade grown due to a photosynthetic effect that results in higher sugar production in the leaf. On the other hand, the shade grown wrapper is protected from the sun’s rays. The result is a thin, light brown milder wrapper. Deciding on which wrapper to choose depends on your own personal choice. When I purchase cigars I take in to consideration pairings, activities and sometimes my general mood. Generally, my mood is always elevated after having enjoyed the medium bodied, somewhat spicy, and always delicious Queen B!